Hats off to Homecoming Week! Happy early fall! 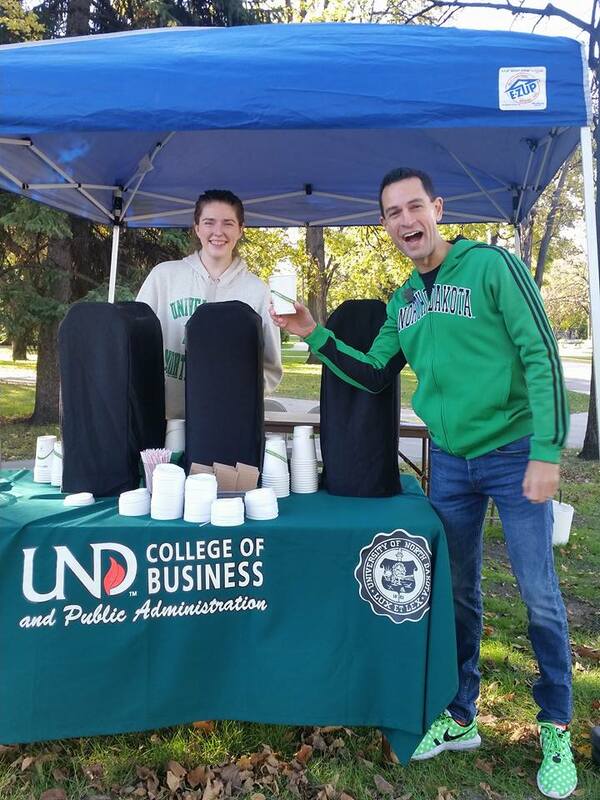 The College of Business & Public Administration is thri lled to celebrate a tremendous series of Homecoming week events! When growing up in Indiana, I always loved Homecoming – the big game, the food, family, and fun around it. Nothing’s changed on that front, other than being home at the CoBPA. The 2017 Sioux Awards showcased the fantastic careers and stories of UND Alumni. The CoBPA was proud to celebrate with our alumni, Al Royse,’72,’73,’76, who received the Sioux Award, as well as our Young Alumni Achievement Award winners Jules Kotrba,’07, and Eric Trueblood,’06. Each of these distinguished alumni shared their valuable time with our students as featured panelists for the Mellem Business Symposium, and in over 10 classroom visits throughout the week. Our students were grateful for our alums’ generosity of time and talent in describing their personal and professional journeys. BTW, did you know the first business courses were offered at UND in 1917? That’s 100 years, and counting! Our Mellem Symposium was standing-room only for Al, Jules, and Eric, as we explored how far we’ve come, and the Future of Business Education. We discussed the types of skills and grit it takes to succeed, and trends in business itself (broad technology applications, global supply chains, savvy consumers, and more). Please check out the full story, which showcases the event: click here. And the 2017 Accounting Hall of Fame was a spectacular event inducting Brent Kukla,’96, C.J. Whalen,’51,’57, Werner Nistler,’68, and Nancy Zmyslinski,’80. Each received a powerful introduction from a friend or colleague, and shared their own journeys to success. The pride in this program is outstanding, and the legacy of excellence continues to show the remarkable dedication and passion our faculty, students, and alumni exhibit. Cheers to a fantastic week and we look forward to seeing more alumni back on campus soon!